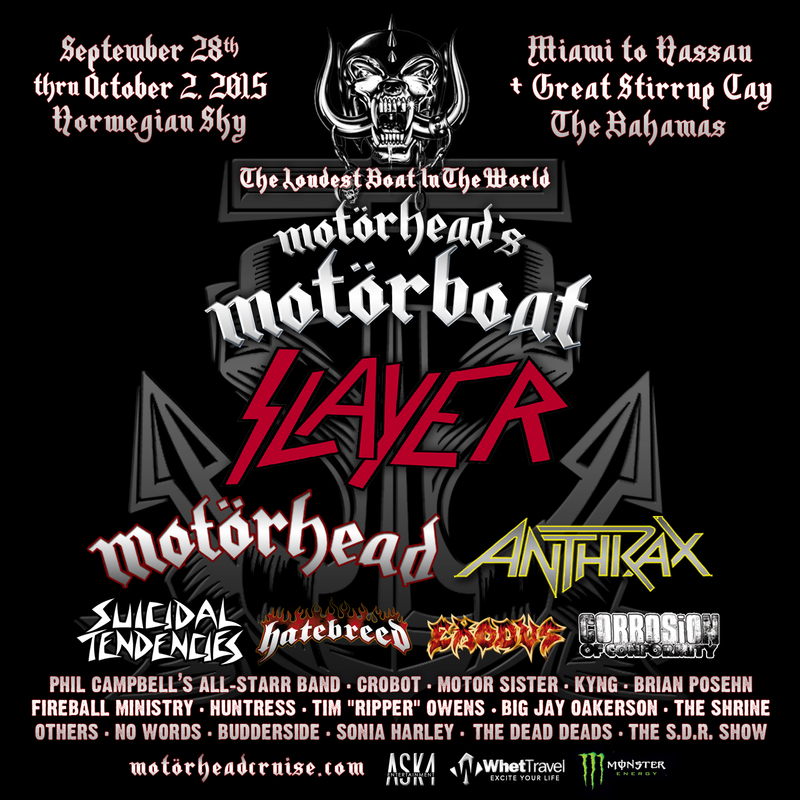 Motörhead’s Motörboat 2015 is on-sale now! The second annual summit for hard rock and metal music lovers from around the globe will feature performances from Slayer, Motörhead, Anthrax, Suicidal Tendencies, Hatebreed, Exodus, Phil Campbell’s All-Starr Band, Crobot, Motor Sister, KYNG, Fireball Ministry, Huntress and even more artists being announced soon! The Loudest Boat In The Wörld sets sail September 28 through October 2, 2015, on the luxurious Norwegian Sky from Miami to our own private island of Great Stirrup Cay, and Nassau, in The Bahamas! Ready to leave your real life on shore, drink & dine with abandon, and pick up your all access pass to a rock star lifestyle for four days and nights this fall? Resistance is futile! Click below to book your stateroom, and let’s do this ship!!! REGISTER: In order to book a cabin on Motörhead’s Motörboat, you MUST register for an ASK4 Reservations account with username and password. CLICK HERE to register now! Once you’ve registered for your account, you’re ready to do this ship! CLICK HERE or below to select your stateroom, enter your cabinmate info, make your deposit, and join us onboard! If you have any questions regarding pre-book tokens, stateroom pricing, or the booking process, please contact the ASK4 Reservations team at Whet Travel by emailing motorboat@whettravel.com or by calling 877-GET-WHET (438-9438).